The Somali star of "Captain Phillips"
A U.S. raid on al-Qaeda-linked militants; the 20th anniversary of Black Hawk Down; a new film on the true-story pirating of an American shipping vessel – Somalia, the war-ravaged East African nation, finds itself in the news now more than almost any other time in recent memory. The hijacking of an unarmed American ship by Somali pirates in April 2009, and subsequent commando rescue operation by U.S. Navy Seals, is the subject of “Captain Phillips,” a new movie starring Tom Hanks and first-time Somali actor Barkhad Abdi, and directed by Paul Greengrass. CNN’s Christiane Amanpour spoke with all three in an interview that aired Wednesday. On its face, the film is indeed about antagonist and protagonist – Somali pirates hold for ransom an American crew and their captain, Richard Phillips, forcing an intervention by the American military. 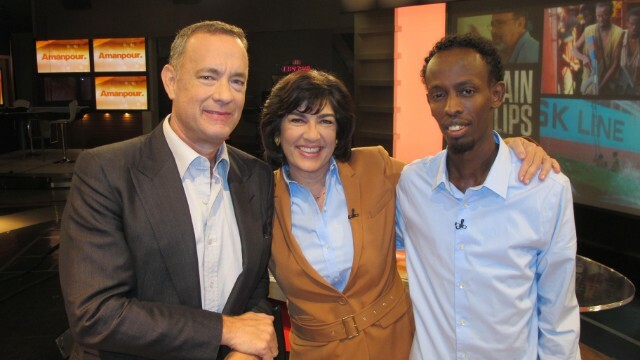 But reality, as Hanks told Amanpour, is often – and in this case as well – more complicated, as evidenced by the interaction between Captain Phillips and his four Somalis captors. The filmmakers could hardly have known how relevant that mirror to nature would be when their movie premiered. Terrorism – and vigilantism, lawlessness – in East and North Africa has come under worldwide attention, most notably with the spectacular attack on a Nairobi, Kenya shopping mall by al-Shabaab, an al-Qaeda subsidiary based in Somalia. “One of the wonderful central threads of moviemaking is to tell us about the world, tell us where we sit,” Greengrass told Amanpour. Greengrass sees as a particular success the film’s portrayal of Somali pirates as cogs in a well-organized criminal enterprise, not just independent vigilantes. This hijacking of the Maersk Alabama was a front-page story for days in 2009; far from just retelling the story, Greengrass said, filmmaking can give the viewer a new perspective on the story. Some of the most compelling characters of “Captain Phillips” are the Somali pirates, who were all but anonymous to the public at the time of the hijacking. Going into casting, the director was nervous about being able to cast actors who could play opposite Hollywood legend Tom Hanks. The star they found was Barkhad Abdi, an immigrant from Somalia who had done no professional acting, who plays the lead pirate, Muse. Abdi saw the casting call for Somali actors on local television. He had shot some videos, he said – “music videos and such” – but never in front of the camera. Now, as a Hollywood star, Abdi all but steals the movie. In a riveting scene early in the film, Muse, having just boarded the Maersk Alabama, stands opposite Captain Phillips, AK-47 in hand, and points at his eyes. “I'm the captain now,” Muse says, with a steely calm. It’s a line that, as the climax of trailers running over and over, is almost already a cinema classic. And as Greengrass told Amanpour, “there’s nobody more dangerous” than a young man with a gun who thinks he has nothing to lose. Greengrass put Abdi and his costars through a rigorous training regimen before filming – not only how to hold a weapon, fight, and stand still on a fast-movie boat, but even how to swim. Most of them, he said, are just young men that are being exploited. Abdi told Amanpour that he still has family in Somalia – some whom he has met and some he hasn’t. He hopes, one day, to be able to visit them. In the meantime, he has been catapulted from his home in Minneapolis to Hollywood stardom. “If you can get past the self-consciousness of saying you're an actor and performing, the moviemaking racket is something you can figure out in a morning or an afternoon,” Hanks said. So what, Amanpour asked, will Abdi do now? Just went to check out the trailer after reading this. Certainly got my attention, and they're dead on about Mr. Abdi. Definitely going to see this in the theater. with this movie people are going to understand that Somalia has some fine actors. that is the biggest news! not everybody is a pirate. Tom Hanks for President of the world! I think she's great. So, she had some fun. So what? Well adam I also think she's great .... but you surprise by asking "so what" ... the so what is that being a fawning sycophant does not suit her or investigative journalism or the viewing public who she is supposed to serve ...especially when such behavior promotes a false movie and is used as part of commercial advertising to increase movie profits.. in short adam the "so what" is that it is dishonest and a disservice to the public...why do you find this so acceptable adam... does your admiration for her make it impossible for you to be discerning and incapable of recognizing when you are being manipulated?....sounds like you get as goo ga over celebrity as much as Amanpour did in this so called "interview". Hey Barrett, I'm guessing that you don't approve of Christiane's puff piece. Well so what. What she does is entertainment. I'm not really sure how asking Tom or the other two about ongoing legal matters that have anything to do with them is good journalism, but I'm sure you'll be able to tell me. Hey Barrett, I am interested in knowing and so are many but I think that to paint todays Christiane and the USS CNN in which she travels with the investigative journalism brush is a bit disingenuous. She and her producers could do more with the reach and power that they hold, but they shoot for low hanging fruit. Their version of 'hard hitting' is nothing more than PR.